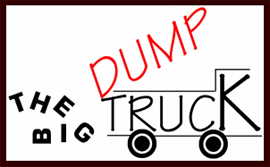 Why is it called the Big DumpTruck? Back when the earth’s crust was still cooling, I was a tech writer at a company in Waltham. The web and browsers were brand new, and I decided it would be a good thing to learn HTML. So I signed up for a free Tripod account (back before they were the pop-up kings) and created a web page called “Utter Uselessness.” The one thing I remember from that page is that the background image made it look like it was written on a hardwood floor. Yes, it’s easy to read text with THAT background. Oh, and look! I can change font colors! Off the main U.U. page was this page of little random thoughts that I called The Big DumpTruck. A lot of what was on that page had to do with my commuting adventures, and a lot of times I got stuck behind those big dumptrucks full of gravel that just seem to spray you with rocks. So those became the “thought pebbles” in the tagline. Eventually I decided that all the other stuff was secondary, registered the domain, and redesigned the site around the BDT. So there you have it. If you want to reach me, I’m everywhere I need to be as @bigdumptruck.